The empirical formula is C18H19N3OHCl2H2O, representing a molecular weight of 365.9. Ondansetron HCl dihydrate USP is a white to off-white powder that is soluble in water and normal saline. The empirical formula is C18H19N3O representing a molecular weight of 293.4. Each 4-mg ondansetron hydrochloride tablet for oral administration contains ondansetron HCl dihydrate USP equivalent to 4 mg of ondansetron. The dimensions for 4-mg ondansetron hydrochloride tablets are 10.10 x 5.60 mm. Each 8-mg ondansetron hydrochloride tablet for oral administration contains ondansetron HCl dihydrate USP equivalent to 8 mg of ondansetron. The dimensions for 8-mg ondansetron hydrochloride tablets are 10.10 x 5.60 mm. Each 24-mg ondansetron hydrochloride tablet for oral administration contains ondansetron HCl dihydrate USP equivalent to 24 mg of ondansetron. The dimensions for 24-mg ondansetron hydrochloride tablets are 14.10 x 7.60 mm. Each tablet also contains the inactive ingredients colloidal silicon dioxide, hypromellose, iron oxide yellow (8 mg tablet only), iron oxide red (24 mg tablet only), lactose monohydrate, magnesium stearate, microcrystalline cellulose, pregelatinized starch, titanium dioxide and triacetin. 4 mg ondansetron base. 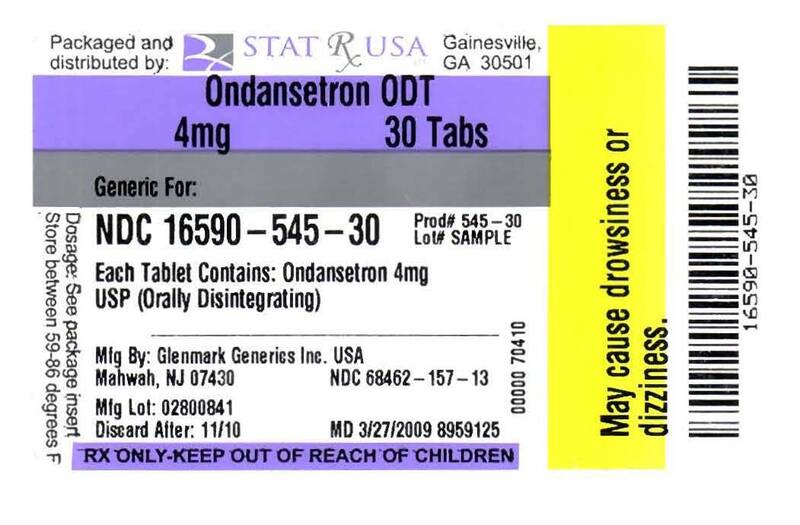 Each 8-mg ondansetron orally disintegrating tablet USP for oral administration contains 8 mg ondansetron base. Each ondansetron orally disintegrating tablet USP also contains the inactive ingredients aspartame, colloidal silicon dioxide, crospovidone, magnesium stearate, mannitol, sodium stearyl fumarate and strawberry flavor. Ondansetron orally disintegrating tablets USP are orally administered formulation of ondansetron which rapidly disintegrates on the tongue and does not require water to aid dissolution or swallowing. This product disintegrates in approximately 60 seconds. Ondansetron is a selective 5-HT3 receptor antagonist. While its mechanism of action has not been fully characterized, ondansetron is not a dopamine-receptor antagonist. Serotonin receptors of the 5-HT3 type are present both peripherally on vagal nerve terminals and centrally in the chemoreceptor trigger zone of the area postrema. It is not certain whether ondansetron's antiemetic action is mediated centrally, peripherally, or in both sites. However, cytotoxic chemotherapy appears to be associated with release of serotonin from the enterochromaffin cells of the small intestine. In humans, urinary 5-HIAA (5-hydroxyindoleacetic acid) excretion increases after cisplatin administration in parallel with the onset of emesis. The released serotonin may stimulate the vagal afferents through the 5-HT3 receptors and initiate the vomiting reflex. In animals, the emetic response to cisplatin can be prevented by pretreatment with an inhibitor of serotonin synthesis, bilateral abdominal vagotomy and greater splanchnic nerve section, or pretreatment with a serotonin 5-HT3 receptor antagonist. In normal volunteers, single intravenous doses of 0.15 mg/kg of ondansetron had no effect on esophageal motility, gastric motility, lower esophageal sphincter pressure, or small intestinal transit time. Multiday administration of ondansetron has been shown to slow colonic transit in normal volunteers. Ondansetron has no effect on plasma prolactin concentrations. Ondansetron does not alter the respiratory depressant effects produced by alfentanil or the degree of neuromuscular blockade produced by atracurium. Interactions with general or local anesthetics have not been studied. Ondansetron is well absorbed from the gastrointestinal tract and undergoes some first-pass metabolism. Mean bioavailability in healthy subjects, following administration of a single 8-mg tablet, is approximately 56%. Ondansetron systemic exposure does not increase proportionately to dose. AUC from a 16-mg tablet was 24% greater than predicted from an 8-mg tablet dose. This may reflect some reduction of first-pass metabolism at higher oral doses. Bioavailability is also slightly enhanced by the presence of food but unaffected by antacids. Ondansetron is extensively metabolized in humans, with approximately 5% of a radiolabeled dose recovered as the parent compound from the urine. The primary metabolic pathway is hydroxylation on the indole ring followed by subsequent glucuronide or sulfate conjugation. Although some nonconjugated metabolites have pharmacologic activity, these are not found in plasma at concentrations likely to significantly contribute to the biological activity of ondansetron. In vitro metabolism studies have shown that ondansetron is a substrate for human hepatic cytochrome P-450 enzymes, including CYP1A2, CYP2D6, and CYP3A4. In terms of overall ondansetron turnover, CYP3A4 played the predominant role. Because of the multiplicity of metabolic enzymes capable of metabolizing ondansetron, it is likely that inhibition or loss of one enzyme (e.g., CYP2D6 genetic deficiency) will be compensated by others and may result in little change in overall rates of ondansetron elimination. Ondansetron elimination may be affected by cytochrome P-450 inducers. In a pharmacokinetic study of 16 epileptic patients maintained chronically on CYP3A4 inducers, carbamazepine, or phenytoin, reduction in AUC, Cmax, and T½ of ondansetron was observed.1 This resulted in a significant increase in clearance. However, on the basis of available data, no dosage adjustment for ondansetron is recommended (see PRECAUTIONS: Drug interactions). In humans, carmustine, etoposide, and cisplatin do not affect the pharmacokinetics of ondansetron. Gender differences were shown in the disposition of ondansetron given as a single dose. The extent and rate of ondansetron's absorption is greater in women than men. Slower clearance in women, a smaller apparent volume of distribution (adjusted for weight), and higher absolute bioavailability resulted in higher plasma ondansetron levels. These higher plasma levels may in part be explained by differences in body weight between men and women. It is not known whether these gender-related differences were clinically important. More detailed pharmacokinetic information is contained in Tables 1 and 2 taken from 2 studies. A reduction in clearance and increase in elimination half-life are seen in patients over 75 years of age. In clinical trials with cancer patients, safety and efficacy was similar in patients over 65 years of age and those under 65 years of age; there was an insufficient number of patients over 75 years of age to permit conclusions in that age-group. No dosage adjustment is recommended in the elderly. In patients with mild-to-moderate hepatic impairment, clearance is reduced 2-fold and mean half-life is increased to 11.6 hours compared to 5.7 hours in normals. In patients with severe hepatic impairment (Child-Pugh2 score of 10 or greater), clearance is reduced 2-fold to 3-fold and apparent volume of distribution is increased with a resultant increase in half-life to 20 hours. In patients with severe hepatic impairment, a total daily dose of 8 mg should not be exceeded. Due to the very small contribution (5%) of renal clearance to the overall clearance, renal impairment was not expected to significantly influence the total clearance of ondansetron. However, ondansetron oral mean plasma clearance was reduced by about 50% in patients with severe renal impairment (creatinine clearance less 30 mL/min). This reduction in clearance is variable and was not consistent with an increase in half-life. No reduction in dose or dosing frequency in these patients is warranted. Plasma protein binding of ondansetron as measured in vitro was 70% to 76% over the concentration range of 10 to 500 ng/mL. Circulating drug also distributes into erythrocytes. Four-and 8-mg doses of ondansetron orally disintegrating tablets are bioequivalent to corresponding doses of ondansetron hydrochloride tablets and may be used interchangeably. One 24-mg ondansetron hydrochloride tablet is bioequivalent to and interchangeable with three 8-mg ondansetron hydrochloride tablets. Prevention of nausea and vomiting associated with highly emetogenic cancer chemotherapy, including cisplatin â‰¥50 mg/m2. Prevention of nausea and vomiting associated with initial and repeat courses of moderately emetogenic cancer chemotherapy. Prevention of nausea and vomiting associated with radiotherapy in patients receiving either total body irradiation, single high-dose fraction to the abdomen, or daily fractions to the abdomen. Prevention of postoperative nausea and/or vomiting. As with other antiemetics, routine prophylaxis is not recommended for patients in whom there is little expectation that nausea and/or vomiting will occur postoperatively. In patients where nausea and/or vomiting must be avoided postoperatively, ondansetron hydrochloride tablets and ondansetron orally disintegrating tablets are recommended even where the incidence of postoperative nausea and/or vomiting is low. Ondansetron hydrochloride tablets and ondansetron orally disintegrating tablets are contraindicated for patients known to have hypersensitivity to the drug. Hypersensitivity reactions have been reported in patients who have exhibited hypersensitivity to other selective 5-HT3 receptor antagonists. Ondansetron is not a drug that stimulates gastric or intestinal peristalsis. It should not be used instead of nasogastric suction. The use of ondansetron in patients following abdominal surgery or in patients with chemotherapy-induced nausea and vomiting may mask a progressive ileus and/or gastric distension. Rarely and predominantly with intravenous ondansetron, transient ECG changes including QT interval prolongation have been reported. Phenylketonuric patients should be informed that ondansetron orally disintegrating tablets contain phenylalanine (a component of aspartame). Each 4 mg and 8 mg orally disintegrating tablet contains 1.5 mg and 3 mg of phenylalanine, respectively. Patients should be instructed not to remove ondansetron orally disintegrating tablets from the blister until just prior to dosing. The tablet should not be pushed through the foil. With dry hands, the blister backing should be peeled completely off the blister. The tablet should be gently removed and immediately placed on the tongue to dissolve and be swallowed with the saliva. Peelable illustrated stickers are affixed to the product carton that can be provided with the prescription to ensure proper use and handling of the product. Ondansetron does not itself appear to induce or inhibit the cytochrome P-450 drug-metabolizing enzyme system of the liver (see CLINICAL PHARMACOLOGY: Pharmaceokinetica:). Because ondansetron is metabolized by hepatic cytochrome P-450 drug-metabolizing enzymes (CYP3A4, CYP2D6, CYP1A2), inducers or inhibitors of these enzymes may change the clearance and, hence, the half-life of ondansetron. On the basis of available data, no dosage adjustment is recommended for patients on these drugs. Chemotherapy: Tumor response to chemotherapy in the P-388 mouse leukemia model is not affected by ondansetron. In humans, carmustine, etoposide, and cisplatin do not affect the pharmacokinetics of ondansetron. In a crossover study in 76 pediatric patients, I.V. ondansetron did not increase blood levels of high-dose methotrexate. Use in Surgical Patients: The coadministration of ondansetron had no effect on the pharmacokinetics and pharmacodynamics of temazepam. Carcinogenic effects were not seen in 2-year studies in rats and mice with oral ondansetron doses up to 10 and 30 mg/kg/day, respectively. Ondansetron was not mutagenic in standard tests for mutagenicity. Oral administration of ondansetron up to 15 mg/kg/day did not affect fertility or general reproductive performance of male and female rats. Pregnancy Category B. Reproduction studies have been performed in pregnant rats and rabbits at daily oral doses up to 15 and 30 mg/kg/day, respectively, and have revealed no evidence of impaired fertility or harm to the fetus due to ondansetron. There are, however, no adequate and well-controlled studies in pregnant women. Because animal reproduction studies are not always predictive of human response, this drug should be used during pregnancy only if clearly needed. Ondansetron is excreted in the breast milk of rats. It is not known whether ondansetron is excreted in human milk. Because many drugs are excreted in human milk, caution should be exercised when ondansetron is administered to a nursing woman. Little information is available about dosage in pediatric patients 4 years of age or younger (see CLINICAL PHARMACOLGY and DOSAGE AND ADMINISTRATIONsections for use in pediatric patients 4 to 18 years of age). Of the total number of subjects enrolled in cancer chemotherapy-induced and postoperative nausea and vomiting in US- and foreign-controlled clinical trials, for which there were subgroup analyses, 938 were 65 years of age and over. No overall differences in safety or effectiveness were observed between these subjects and younger subjects, and other reported clinical experience has not identified differences in responses between the elderly and younger patients, but greater sensitivity of some older individuals cannot be ruled out. Dosage adjustment is not needed in patients over the age of 65 (see CLINICAL PHARMACOLGY. The following have been reported as adverse events in clinical trials of patients treated with ondansetron, the active ingredient of ondansetron hydrochloride. A causal relationship to therapy with ondansetron hydrochloride has been unclear in many cases. The adverse events in Table 5 have been reported in 5% of adult patients receiving a single 24-mg ondansetron hydrochloride tablet in 2 trials. These patients were receiving concurrent highly emetogenic cisplatin-based chemotherapy regimens (cisplatin dose 50 mg/m2). The adverse events in Table 6 have been reported in 5% of adults receiving either 8 mg of ondansetron hydrochloride tablets 2 or 3 times a day for 3 days or placebo in 4 trials. These patients were receiving concurrent moderately emetogenic chemotherapy, primarily cyclophosphamide-based regimens. There have been rare reports consistent with, but not diagnostic of, extrapyramidal reactions in patients receiving ondansetron. In 723 patients receiving cyclophosphamide-based chemotherapy in US clinical trials, AST and/or ALT values have been reported to exceed twice the upper limit of normal in approximately 1% to 2% of patients receiving ondansetron hydrochloride tablets. The increases were transient and did not appear to be related to dose or duration of therapy. On repeat exposure, similar transient elevations in transaminase values occurred in some courses, but symptomatic hepatic disease did not occur. The role of cancer chemotherapy in these biochemical changes cannot be clearly determined. There have been reports of liver failure and death in patients with cancer receiving concurrent medications including potentially hepatotoxic cytotoxic chemotherapy and antibiotics. The etiology of the liver failure is unclear. Rash has occurred in approximately 1% of patients receiving ondansetron. Rare cases of anaphylaxis, bronchospasm, tachycardia, angina (chest pain), hypokalemia, electrocardiographic alterations, vascular occlusive events, and grand mal seizures have been reported. Except for bronchospasm and anaphylaxis, the relationship to ondansetron hydrochloride was unclear. The adverse events reported in patients receiving ondansetron hydrochloride tablets and concurrent radiotherapy were similar to those reported in patients receiving ondansetron hydrochloride tablets and concurrent chemotherapy. The most frequently reported adverse events were headache, constipation, and diarrhea. The adverse events in Table 7 have been reported in 5% of patients receiving ondansetron hydrochloride tablets at a dosage of 16 mg orally in clinical trials. With the exception of headache, rates of these events were not significantly different in the ondansetron and placebo groups. These patients were receiving multiple concomitant perioperative and postoperative medications. Preliminary observations in a small number of subjects suggest a higher incidence of headache when ondansetron orally disintegrating tablets are taken with water, when compared to without water. In addition to adverse events reported from clinical trials, the following events have been identified during post-approval use of oral formulations of ondansetron hydrochloride. Because they are reported voluntarily from a population of unknown size, estimates of frequency cannot be made. The events have been chosen for inclusion due to a combination of their seriousness, frequency of reporting, or potential causal connection to ondansetron hydrochloride. Cardiovascular: Rarely and predominantly with intravenous ondansetron, transient ECG changes including QT interval prolongation have been reported. General: Flushing. Rare cases of hypersensitivity reactions, sometimes severe (e.g., anaphylaxis/anaphylactoid reactions, angioedema, bronchospasm, shortness of breath, hypotension, laryngeal edema, stridor) have also been reported. Laryngospasm, shock, and cardiopulmonary arrest have occurred during allergic reactions in patients receiving injectable ondansetron. There is no specific antidote for ondansetron overdose. Patients should be managed with appropriate supportive therapy. Individual intravenous doses as large as 150 mg and total daily intravenous doses as large as 252 mg have been inadvertently administered without significant adverse events. These doses are more than 10 times the recommended daily dose. In addition to the adverse events listed above, the following events have been described in the setting of ondansetron overdose: â€œSudden blindnessâ€ (amaurosis) of 2 to 3 minutesâ€™ duration plus severe constipation occurred in 1 patient that was administered 72 mg of ondansetron intravenously as a single dose. Hypotension (and faintness) occurred in a patient that took 48 mg of ondansetron hydrochloride tablets. Following infusion of 32 mg over only a 4-minute period, a vasovagal episode with transient second-degree heart block was observed. In all instances, the events resolved completely. Do not attempt to push ondansetron orally disintegrating tablets through the foil backing. With dry hands, PEEL BACK the foil backing of 1 blister and GENTLY remove the tablet. IMMEDIATELY place the ondansetron orally disintegrating tablet on top of the tongue where it will dissolve in seconds, then swallow with saliva. Administration with liquid is not necessary. The recommended adult oral dosage of ondansetron hydrochloride is 24 mg given as three 8-mg tablets administered 30 minutes before the start of single-day highly emetogenic chemotherapy, including cisplatin â‰¥50 mg/m2. Multiday, single-dose administration of a 24 mg dosage has not been studied. There is no experience with the use of a 24 mg dosage in pediatric patients. The dosage recommendation is the same as for the general population. The recommended adult oral dosage is one 8-mg ondansetron hydrochloride tablet or one 8-mg ondansetron orally disintegrating tablet given twice a day. The first dose should be administered 30 minutes before the start of emetogenic chemotherapy, with a subsequent dose 8 hours after the first dose. One 8-mg ondansetron hydrochloride tablet or one 8-mg ondansetron orally disintegrating tablet should be administered twice a day (every 12 hours) for 1 to 2 days after completion of chemotherapy. For pediatric patients 12 years of age and older, the dosage is the same as for adults. For pediatric patients 4 through 11 years of age, the dosage is one 4-mg ondansetron hydrochloride tablet or one 4-mg ondansetron orally disintegrating tablet given 3 times a day. The first dose should be administered 30 minutes before the start of emetogenic chemotherapy, with subsequent doses 4 and 8 hours after the first dose. One 4-mg ondansetron hydrochloride tablet or one 4-mg ondansetron orally disintegrating tablet should be administered 3 times a day (every 8 hours) for 1 to 2 days after completion of chemotherapy. The dosage is the same as for the general population. The recommended oral dosage is one 8-mg ondansetron hydrochloride tablet or one 8-mg ondansetron orally disintegrating tablet given 3 times a day. For total body irradiation, one 8-mg ondansetron hydrochloride tablet or one 8-mg ondansetron orally disintegrating tablet should be administered 1 to 2 hours before each fraction of radiotherapy administered each day. For single high-dose fraction radiotherapy to the abdomen, one 8-mg ondansetron hydrochloride tablet or one 8-mg ondansetron orally disintegrating tablet should be administered 1 to 2 hours before radiotherapy, with subsequent doses every 8 hours after the first dose for 1 to 2 days after completion of radiotherapy. For daily fractionated radiotherapy to the abdomen, one 8-mg ondansetron hydrochloride tablet or one 8-mg ondansetron orally disintegrating tablet should be administered 1 to 2 hours before radiotherapy, with subsequent doses every 8 hours after the first dose for each day radiotherapy is given. There is no experience with the use of ondansetron hydrochloride tablets or ondansetron orally disintegrating tablets in the prevention of radiation-induced nausea and vomiting in pediatric patients. The recommended dosage is 16 mg given as two 8-mg ondansetron hydrochloride tablets or two 8-mg ondansetron orally disintegrating tablets 1 hour before induction of anesthesia. There is no experience with the use of ondansetron hydrochloride tablets or ondansetron orally disintegrating tablets in the prevention of postoperative nausea and vomiting in pediatric patients. The dosage recommendation is the same as for the general population. There is no experience beyond first-day administration of ondansetron. In patients with severe hepatic impairment (Child-Pugh2 score of 10 or greater), clearance is reduced and apparent volume of distribution is increased with a resultant increase in plasma half-life. In such patients, a total daily dose of 8 mg should not be exceeded. Bottles of 30 tablets (NDC 68462-105-30). Carton containing 1 card with 3 unit of use blisters (NDC 68462-105-33). Bottles of 30 tablets (NDC 68462-106-30). Carton containing 1 card with 3 unit of use blisters (NDC 68462-106-33). Bottles: Store at 20º - 25ºC (68º - 77ºF) (See USP Controlled Room Temperature). Dispense in a tight, light-resistant container as defined in the USP. Carton: Store at 20º - 25ºC (68º - 77ºF) (See USP Controlled Room Temperature). Protect from light. Store blister in carton. Ondansetron hydrochloride tablets, 24 mg (ondansetron HCl dihydrate USP equivalent to 24 mg of ondansetron), are pink, oval, standard convex, film-coated tablets with â€˜24â€™ on one side and â€˜G1â€™ logo on the other side in daily unit dose packs of 1 tablet (NDC 68462-107-40). Store at 20º - 25ºC (68º - 77ºF) (See USP Controlled Room Temperature). Ondansetron orally disintegrating tablets USP, 4 mg (as 4 mg ondansetron base) are white, circular, flat faced, uncoated tablets with â€˜Gâ€™ engraved on one side and â€˜4â€™ on the other side in unit dose packs of 30 tablets (NDC 68462-157-13). Ondansetron orally disintegrating tablets USP, 8 mg (as 8 mg ondansetron base) are white, circular, flat faced, uncoated tablets with â€˜Gâ€™ engraved on one side and â€˜8â€™ on the other side in unit dose packs of 10 tablets (NDC 68462-158-11) and 30 tablets (NDC 68462-158-13). Store at 20°-25°C (68°- 77°F) (See USP Controlled Room Temperature). Britto MR, Hussey EK, Mydlow P, et al. Effect of enzyme inducers on ondansetron (OND) metabolism in humans. Clin Pharmacol Ther. 1997;61:228. Pugh RNH, Murray-Lyon IM, Dawson JL, Pietroni MC, Williams R. Transection of the oesophagus for bleeding oesophageal varices. Brit J Surg. 1973;60:646-649. Villikka K, Kivisto KT, Neuvonen PJ. The effect of rifampin on the pharmacokinetics of oral and intravenous ondansetron. Clin Pharmacol Ther. 1999;65:377-381. De Witte JL, Schoenmaekers B, Sessler DI, et al. Anesth Analg. 2001;92:1319-1321. Arcioni R, della Rocca M, Romanò R, et al. Anesth Analg. 2002;94:1553-1557. Ondansetron does not itself appear to induce or inhibit the cytochrome P-450 drug-metabolizing enzyme system of the liver (seeCLINICAL PHARMACOLOGY: Pharmacokinetics:). Because ondansetron is metabolized by hepatic cytochrome P-450 drug-metabolizing enzymes (CYP3A4, CYP2D6, CYP1A2), inducers or inhibitors of these enzymes may change the clearance and, hence, the half-life of ondansetron. On the basis of available data, no dosage adjustment is recommended for patients on these drugs. Little information is available about dosage in pediatric patients 4 years of age or younger (see CLINICAL PHARMACOLOGY and DOSAGE AND ADMINISTRATION sections for use in pediatric patients 4 to 18 years of age). Of the total number of subjects enrolled in cancer chemotherapy-induced and postoperative nausea and vomiting in US- and foreign-controlled clinical trials, for which there were subgroup analyses, 938 were 65 years of age and over. No overall differences in safety or effectiveness were observed between these subjects and younger subjects, and other reported clinical experience has not identified differences in responses between the elderly and younger patients, but greater sensitivity of some older individuals cannot be ruled out. Dosage adjustment is not needed in patients over the age of 65 (see CLINICAL PHARMACOLOGY.